Through the Omnes Energy Shared Savings Plan, businesses achieve immediate savings on their utility bills with no start-up costs. Savings are shared with Omnes Energy who owns, installs, and operates the systems. Continuous upgrading during the 20 year life of the system results in increased savings. The energy storage units are installed behind the meter. Data and algorithm parameters are relayed over customer internet or cell data network. Omnes Energy's algorithm will automatically charge and discharge the storage unit to reduce peak demand and shift load. In case of system faults, electric service continues to the customer's site as before with no interruption of service. Billing charges from the utility are based on a combination of the highest peak demand, and the energy used per month. Omnes Energy's system reduces peak demand to generate large savings. Often these rates are highest during the summer. Energy used during peak times are more expensive than off-peak consumption. Omnes Energy's system stores energy at night when utility prices are low and discharges the energy during expensive peak times. 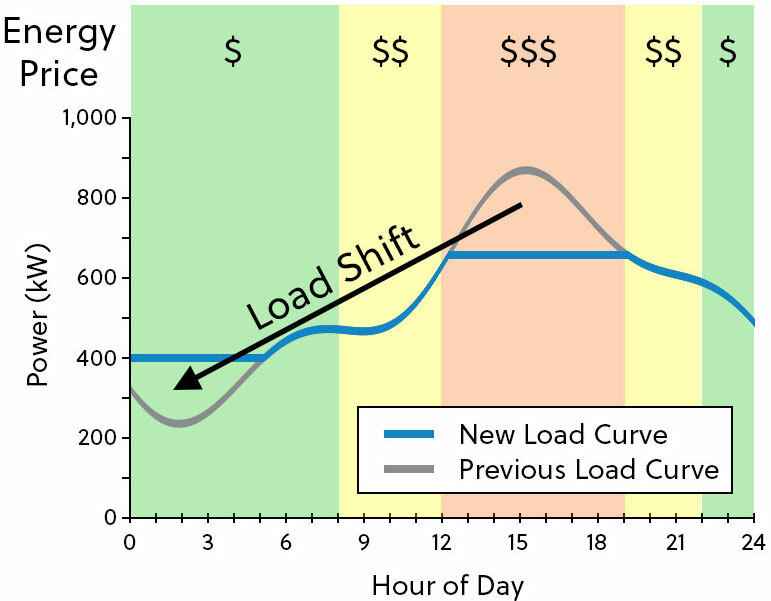 Omnes Energy's storage units conduct load shifting and peak reduction automatically and concurrently. Step 1 - The customer's load profile is analyzed to estimate the total savings. Step 2 - Suitable installation sites are identified and the shared savings agreement is determined. Step 3 - After approval, the devices and software are installed, connected to the grid, and operations initiated. Step 4 - Monthly performance reports are provided during the operation of the system, and system upgrades are installed to generate additional savings.